How many times have we got one of those emails from an African country, promising us a large reward for letting them use our bank account to transfer money? You might think that in this day and age, people are aware of such fraudulent acts and do not fall into such traps. Wrong! There’s still a large number of people who fall for such things, as in the case of Sherif, an Indian living in Doha – who happens to hail from the same Indian district that I am from – Kannur. As per a newspaper report, Sherif paid the Nigerian guy about $80,000 as ‘processing fee’ for transferring $150,000 to his bank account in Kerala, India. He eventually got ‘suspicious’ when the Nigerian kept asking for more money and complained to the Cyber Cell of the Kerala Police. The cops set a trap for the Nigerian, Shabha Muhammed Razaq, and asked him to come to Bangalore to collect more money. Razaq walked into the police trap and he was caught with counterfeit US currency, fake passports and some chemicals (?!). Razak was part of a much bigger gang engaged in internet fraud in India and admitted tricking many people living in other Indian states. A great job done by the Cybercops of Kerala! However, the general public need to be more alert and aware about such scams, that take advantage one basic human instinct – greed! Here’s one for users and IT support personnel who sometimes have problems understanding what exactly an email non-delivery report (NDR) is trying to convey. Messaging experts, please excuse. In Exchange Server, all NDRs returned to the sender appear to come from the local Exchange Server of your organization and not from the remote recipient’s mail server – even if the problem is at the receiving end. If the mail is received at the remote server and an error occurs during further re-routing/relaying, then the NDR might not appear to come from your organization’s Exchange Server. The NDR is formatted in an easy-to-read email message by the Exchange server in your organization and is sent back to the sender. So, how easy is it to understand an NDR? At first sight of the new, well-designed NDR of Exchange Server 2007, most users and non-email administrators tend to think that the problem is always on the local Exchange Server. 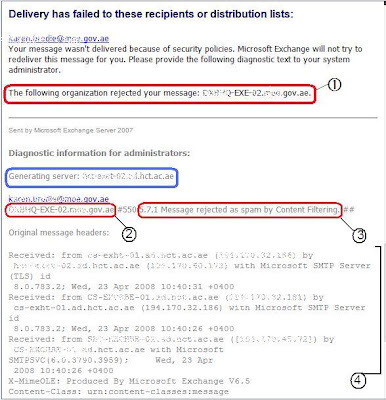 To add to the confusion the NDR contains the words “Sent by Microsoft Exchange Server 2007” and “Generating server: “. The text marked in blue is not what’s important. It will always show YOUR organizations edge transport server – unless the error occurred at a subsequent mail re-routing operation at the destination. Pay attention to the part that I’ve marked in red. The part labeled (1) is more important. It gives you an overview of what’s wrong – but need not always give you the full picture. The part labeled (2) is the server on which the error occurred. If this doesn’t look like one of the servers inside your organization, the problem is most likely not at your end. The part labeled (3) is the error reported by the server mentioned in (2). Part (4) shows the flow of the message between various servers both within and outside your organization. All it takes is a little effort to understand what’s going on. Trust your email servers :). Don’t always think the problem is at your end, even if it looks like your server is reporting the error. Make an earnest attempt and apply some educated logic to figure out where the problem lies. 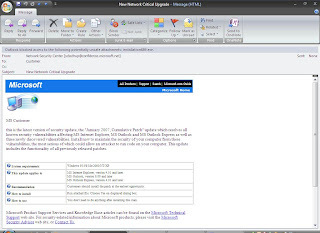 shijaz@2hotmail.com on 4/15/2008 11:09 PM The e-mail account does not exist at the organization this message was sent to. Check the e-mail address, or contact the recipient directly to find out the correct address. The solution? Teach the user how to type an email address correctly :). The year is 2008 and you might be wondering why I’m making such a post. This blogger has seen that even in this time and age, some people simply love POP3 and prefer it over better and more secure alternatives. This post serves as an eye-opener to users as well as administrators who are die-hard POP fans. Traditional POP3 (without any secure configuration – which is also the most common way admins configure your Outlook Express) transmits your username and password over the network in plaintext. Any user with malicious intent, can “sniff” your password over the network and get hold of your email. In most cases, the credentials that you use to retrieve mail are the same that you use to send mail, which means the intruder can not only read your mail, but also send mails to other people on your behalf! Now, relating to the above point, replace the ‘hacker’ with malicious software/spyware/virus on the PC of a legitimate user on your network. The malware can do the sniffing and use the credentials to inject spam into your organization, as well as the rest of the known universe, pretending that its YOU the POP user who is sending the spam. All your emails are dumped to your PC from the server. What if you’ve been using POP for the past 5 years and your PC decides to crash – and you have no backup. What if your PC doesn’t crash, but your mail folders get corrupted – quite common with many POP3 clients. What if you want to access your received emails from some place else and you do not have your PC with you. Of course, for points 3, 4 and 5, you could leave a copy of your mails on the server – but what’s the point in sticking to POP3? – read on! For some users, their email might seem very secure when it’s sitting on their own PC and nowhere else. I have news for you. The moment someone else sits on your PC, kiss privacy goodbye. A knowledgable user can open password protected folders. An additional point to ponder: SMTP traffic on the internet is not encrypted by default. It is most likely that your sensitive email is flying about cyberspace in plain text anyway! If you travel to a partner/client’s office with your laptop, accessing your mailbox via POP3 might require intervention of their network administrator if POP is not already open on their firewall – or you may require some sort of firewall client. No access to your company’s Address Book. Passwords don’t go out in plain text. Just about anybody can’t get hold of your password. If you use RPC over HTTPS, an SSL session is established between your PC and the server that has your email. The email content reaches you in a secure, encrypted channel. The email is stored on your server, and (hopefully) a backup is taken every night. If you use Outlook in cached mode, all you have is an offline copy of the same email – which means its available for your reference even when your PC is not connected to the office network. You can access your company’s Address Book and all your contacts, tasks, calendar, etc. 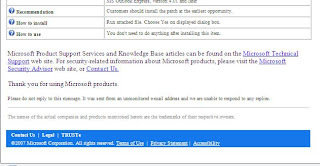 Presence information from Live Communications Server, integration with SharePoint workspaces, etc. Some users need to have more than one Exchange mailbox open at the same time on the same PC (usually executive secretaries). The common excuse is that they cannot configure two Exchange mailboxes on the same Outlook profile. It is indeed possible to configure two Exchange Server mailboxes on the same Outlook profile. Here’s a tip: In Outlook 2007: Tools –> Account Settings –> Select your Exchange mailbox –> Change –> More Settings –> Advanced tab –> Add –> type the second mailbox name –> OK –> Next…Finish. See this page for more details. Talk about security – and Google. GMail users in Kuwait and some other countries reporting being able to read other GMail users’ email without having to log in. Google claims that an ‘ISP caching problem’ that allowed users to log in to other users’ mailboxes. This talks volumes about Google’s security, doesn’t it? Does this mean that an ISP can break Gmail security if it really wants? Wait a minute – how can ‘caching’ at the ISP preserve Gmail sessions? Some neat security, huh? No wonder Gmail is still in Beta. Thawte gives away free personal email certificates at their website. A thawte Personal E-mail Certificate in conjunction with the thawte Web of Trust allows you to secure and guarantee authorship of your e-mail communications by digitally signing and encrypting your e-mails. IN SHORT: A personal email certificate lets you digitally sign all your outgoing email so that the recipient knows that you sent it! Click here to get a certificate. A word of caution here, read everything carefully whilst you apply for digital certificate. Remember the password and the question-answer pairs otherwise you will *never* be able to get another certificate for the same email ID. Also keep your password totally secret – a recipient can take you to court for documents that appear to be digitally signed by you, but was in reality signed in your name by an identity thief! 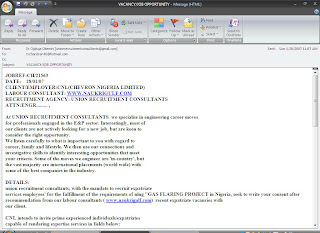 Most of us are already aware of email hoaxes involving Nigerian beneficiaries asking you to help them get their money and offering you a copious sum for the “assistance”. Well, here’s an all-new range of hoaxes. These target job seekers! some of the best companies in the industry. Designs, Geological services,maintenance and commissioning. any of the above listed fields. Local Office strictly for the purpose of this project. This is the second hoax mail I’ve received in the past two weeks. The earlier one was supposedly from Shell UK. I thought I’d join in the fun and sent my CV across. Immediately after, I get my “employment agreement” with a whopping salary attached to it – with NO interview. The contract shows Shell UK website is at http://www.shelluk.com/ – there is no such web site!! Two days later somebody calls me on my phone – out of the blue – and tells me I need to sign the document and send them back. Then an “attorney” would contact me, to discuss “what I should do to get my work permit”. Oh yeah – and that’s where the money part comes. So next time you receive anything in your email, be very sure whom you’re dealing with! There is also a new scam going around from Omni Hotel, Canada. It’s fake. More info here. It had an EXE attachment “installation689.exe”. The message was written in the kind of language Microsoft uses to communicate with its customers – clear, courteous and concise explaining clearly what the update is for, etc. The first thing a novice (or even an intermediate) user would do, is to download the attachment and install the patch. Microsoft NEVER (never never ever) sends an update out to its customers as an email attachment. Microsoft update files normally have a filename that start with the letters “KB” followed by the KB article number. What a clever way to outwit the unsuspecting user! So those of you out there, beware of stuff that comes in your e-mail! Think twice before you run an EXE attachment. From my experience, 9 out of 10 EXE attachments are viruses. Sometimes they appear to come from people you know, because they are actually sent by malicious programs that have already infected their machines.